For the 6th year Barbizon Charlotte participated in 24 Hours of Booty – a fundraising event which brings cyclists of all abilities together to raise vital funds for cancer research and survivorship. The official 24 hour cycling event of the Lance Armstrong Foundation, proceeds benefit both the LIVESTRONG Foundation and local, life-changing charities. The 24 Hours of Booty experience represents hope, challenge, remembrance and celebration. This year’s event raised over $1.15 Million. Charlotte's Myers Park neighborhood is home to the Booty Loop, a popular local 2.97 mile circuit that has a great mixture of hills and flats that challenge riders at every level. At the center of it all is Bootyville, hosted by Queens University at Charlotte, which serves as the event headquarters. Riders set up campsites and canopies where they can eat, sleep, or more importantly, rest and relax with friends off of the bike. 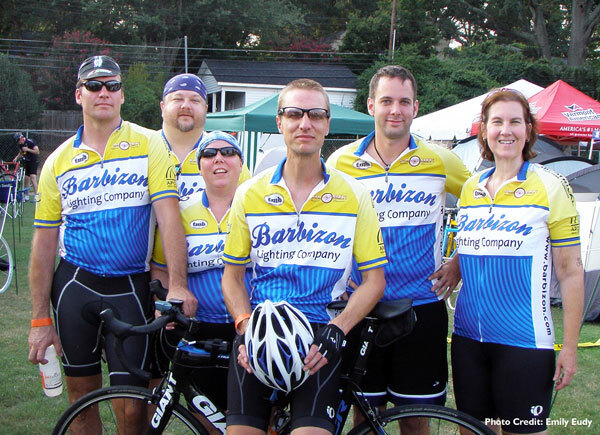 This year’s Barbizon team included Jeff Montgomerie, Esthere and Paul Strom, John Hartness, Lisa Magee and Andrew Fisher. Barbizon would like to thank the following companies who supported our team: Electronic Theatre Controls, Apollo Design Technology, City Theatrical, Rosco Laboratories, TMB Associates, and W.H. Onley Company.